How an Elephants' fleet junks in a mosquito's throat? Ramalinga Wins the War Before Drawing Swords! Ramalinga Attempts to Turn a Dog Into a Cow!!! Ramalinga's Prostrate Adoration to "Donkeys"
Tenali Ramalinga Stories Once when King Sri Krishna Deva Rayalu was ruling the Vijaya Nagar Empire, the royal mother fell sick and was bedridden. The medical professionals of the court declared that there was no chance for her to survive this episode and that she grew too old to respond to any medication. One morning, she summoned Rayalu to her presence. My Dear Son! I realised that I am close to death's door. I also do not have any hopes that my health would become better. However, I have a last wish. She paused and asked, Can you accomplish it for me before my soul is taken away? Rayalu was the King of Kings. His mother was on the deathbed, expressing her last wish. How could he turn away from it? He gently said, Mother! Please tell me I will definitely accomplish your last wish he assured. “I…” she added, “…wish to eat a mango fruit, can you get me one?” in a feeble tone the mother asked Rayalu. It was early summer. Trees had just started bearing tender fruits. There was no guarantee that royal mother would live until the tender ones ripened on the tree, Rayalu thought. It was also an insult to his royalty, if he was unable to fulfil his mother’s last wish. Immediately the King ordered his soldiers to scan through the fields of the kingdom and bring some ripe mangoes at any cost, immediately. The soldiers plunged into action. They did their best and returned with a basket filled with ripe mangoes. Eventually, just before the soldiers could place the basket before their King, king’s mother breathed her last. Rayalu was taken aback, for being unable to fulfil the last wish more than for her demise. He was shook deeply with the thought that his mother was dead even before her quench for mangoes was fulfilled. He slowly started to sink day after the day with the thoughts that were ripping him. Rayalu invited Royal Master Thathacharya, explained his struggle, and sought an advice that would take the suffering off from him. The news spread like wildfire in the kingdom that Rayalu was doling out golden mangoes to Brahmins in the memory of his mother. Brahmins from all over the empire started flooding into the capital to accept the golden mango from the King. Day in and out, long queues were always seen only to add people to its tail. With this, the gold reserves in the exchequer were melting down rapidly. Rayalu not bothering about the consequences was incessantly involved in donating golden mangoes to the Brahmins. He never heeded to the pleas and warnings of the Chief Minister Thimmarusu in this regard. Thimmarusu was in confusion and did not know how to stop the King. He approached Ramalinga and urged for a solution to this in the interest of the kingdom and its people. Ramalinga assured Thimmarusu that he would check it at the earliest. “Go home and have a sound night sleep, Chief Minister. Everything will be alright by tomorrow evening” Ramalinga sent off Thimmarusu. Next morning, Ramalinga went near the long queues and watched what was happening. He then selected a yard close to the queues and sat there, ordering the queue maintenance persons to send each of the Brahmins to him before sending him to Rayalu for the golden mango. Everyone knew that Ramalinga was one of the close associates of the King. They thought that Ramalinga was doing so on the orders of the King and started sending the Brahmins first to Ramalinga before sending them into the palace. Ramalinga told every Brahmin that there was a slight amendment to the donation process. “The King Rayalu wished to donate the golden mangoes to those who bore a blister from him” Ramalinga explained. Brahmins desirous of the gold first had a burn on their backs and went for the King's gold. This went on until afternoon. 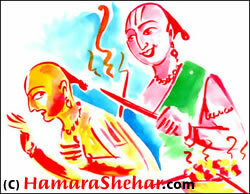 In the later afternoon, one Brahmin pleaded Ramalinga to give him two burns and two golden mangoes. Ramalinga immediately fulfilled the Brahmins wish. The King Rayalu did not understand what was happening. He enquired, “What burns?” Then the Brahmin narrated the entire story about Ramalinga and burns to Rayalu. Wiping the tears dropping on his cheeks, Ramalinga continued, “Probably she would have lived. Nevertheless, I did not heed to her requests. She died with it on her lips. I thought of presenting it to the Brahmins, as I failed to fulfil my mother’s last wish. Rayalu analysed that Ramalinga was attempting to teach his a lesson. He then recalled Thimmarusu’s pleas about the drastically dropping gold reserves in the exchequer. Appreciating the presence of mind and loyalty, Rayalu immediately stopped the programmer.